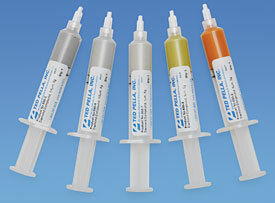 Set: Includes 5 sizes, (5g syringes or 250ml pump sprays) each: 0.25µm, 0.5µm, 1µm, 3µm and 6µm. High quality, fine graded Alumina suspension (water-based) for fine and end polishing of metallographic specimens. Reduces surface distortions and gives excellent polishing results. Can be used for analytical applications where diamond polishing is not suitable (analysis of carbon). A non-crystallizing silica (SiO2) suspension stabilized at an alkaline pH value of 9.8. The combination of very fine abrasive particles in a chemically aggressive liquid provides a chemical-mechanical polishing action. Ideal for final polishing to obtain a deformation-free surface. Obtain excellent results on IC-cross sections, ceramics, minerals, hard steels and ductile non-ferrous materials. Recommended as final polishing for EBSD samples.